Today I want to share with you the four stages of learning anything. But I want to put it in the context of hypnosis and us working together. Now how it works is, at the very top here, you'll see "unconscious incompetence." Basically what that means is you have a problem, but you don't know that you have a problem. So it's not really a problem. It's almost like you're asleep. So you're probably not coming to see me if it's at stage one. Stage two of learning anything is conscious incompetence. You know that you have a problem, but you don't know how to fix it. It can be a very frustrating level to be. It might be the level you're at now, it might be the level which calls you to call me or contact me initially. 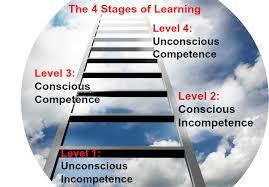 The next stage of learning is conscious competence. And basically what that is is usually when people come in for their first session of hypnosis with me. We give them a bunch of tangible skills, things that they'd have to do consciously with volition, that they're aware that they're doing to change their problem. It's almost like if you brush your teeth if you're right-handed, and then I were to ask you to start brushing your teeth with your left hand. To begin with it's going to feel a bit awkward and a bit weird, but the more you do it...and, say, 21 days experts say it takes to establish a new habit. You'd be consciously doing it, but after about 21 days it'd become habitual and you'd get to what we'd say level 4, which is the level we want you to be in any learning and certainly with hypnosis, which is unconscious competence. You're doing stuff automatically without having to think about it. So if you're a smoker, you're a non-smoker now. You're not even thinking about it. If you had a problem with overeating, you're now just eating good food, healthy food, and you're not even thinking about it anymore. It's just automatic. If it was something you used to be very anxious about, now you're just going to a calm place and you don't have to consciously will yourself to go there. You just go there unconsciously. And that's the level we want to get you all to. So generally, after a first session of hypnosis, you might be, like I say, at level three, which is competence, conscious competence. You're deliberately doing stuff with the conscious part of your mind, but you're practicing over and over again until eventually, like I say, it becomes habitual. And the hypnosis, again, makes this a lot easier, this transition, so we get you to the unconscious competence where you want to be. You're doing the new behavior automatically. Those were the four stages of learning anything, but I just want to put it in the context of hypnosis and us working together so you'd have an understanding of where you're going to be session to session and what you should expect.